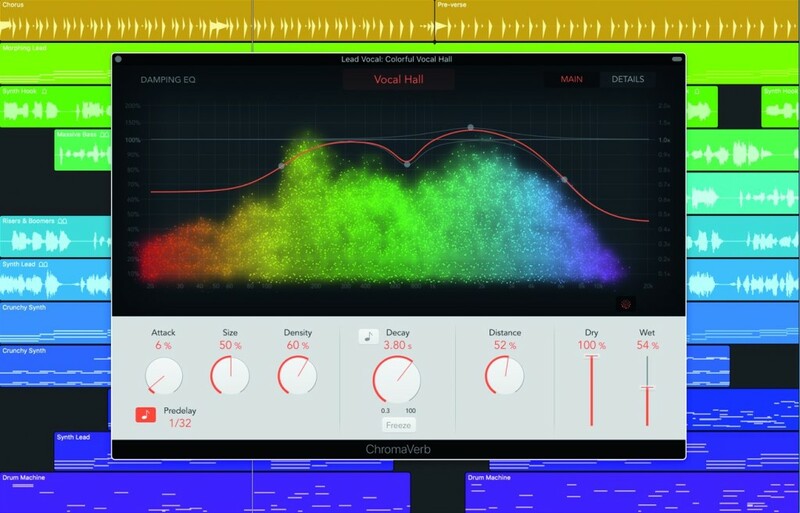 Apple’s free update to Logic adds a slew of new FX. But the banner feature is Smart Tempo: record without a click, and mix and match audio, automatically. Playing to click tracks has been the bane of DAW and sequencer users since the beginning. The idea of Smart Tempo is, you record with a human feel, and automatic detection adjusts the tempo track to match. You can then either keep those tempo changes or sync up the result to a clock. Apple confirms this is the same automatic detection we first saw in their Music Memos app for iOS. There, it may have even been overkill; here, it seems more essential. This is similar to workflows in tools like Ableton Live or Propellerhead Reason which now provide tempo-independent audio functionality, but in Logic, you see it in a more conventional DAW context – and you can be the judge of how well the automatic detection works. Also new in this release: more effects. These are at least in part the fruits of the acquisition of Camel Audio, whose Alchemy instrument has featured large in both Logic and GarageBand. Alchemy is probably the most popular modern product of Camel, but they made great effects here – and that team seem to have been busy. 10.4 adds Vintage EQ emulations – Graphic, Tube, and Console – which in turn emulate classics like the sought-after Pulteq EQ. (That Pulteq has seen recreations by Universal Audio, Waves, and Native Instruments, too.) These look nice enough, and you can mix and match for combined precision – something not generally possible with other emulations. ChromaVerb is an algorithmic effect – that is, these nice colored dots are meant to show you lots of different delays across the audio spectrum. That also gives it some unique controls for adjusting sound. Photo courtesy Apple. ChromaVerb complements the existing convolution-based Space Designer and its physical models of reverberation with algorithmic, digital-style emulation. There’s some nice color animation for additional feedback, with equalization options big and front-and-center, plus a novel “attack” parameter. Phat FX is a multi-effect that’s obviously the successor to CamelPhat – so think warmth, distortion, punch, presence. I loved the original, so I’m curious what the new take sounds like. 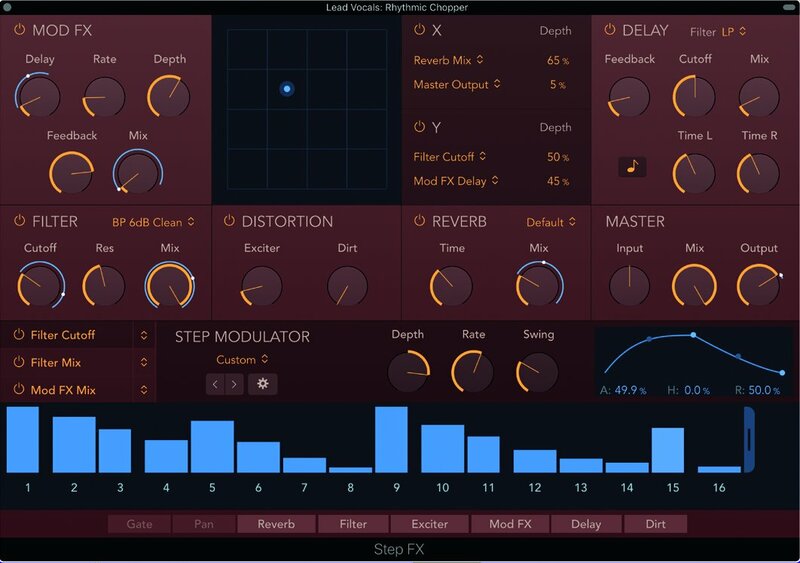 Sequence multiple effects – or even other sequences – in this combined rhythmic sound processing tool, and a new take from Camel greats from the past. The Drummers and Drum Kit Designer range gets more useful as Apple adds brush styles and more content, along with a new Alchemy library and other sound content. There’s also expanded support for tagging and metadata. With Native Instruments pushing their platform hard, I’m curious to see whether Apple can reinvigorate third-party development for their once-proud EXS platform. But at least included content is strong – and of course you can always add via the third-party ecosystem (meaning NI and many others). The big reason you’re unlikely to complain about this is, you’re not going to have to pay for it – continuing Apple’s free upgrades for Logic Pro X. So it’s US$199 to enter, and then a whole mess of free regular updates. On the other hand, I do hear Apple makes other stuff that they charge money for (cough). Speaking of that, Apple are quick to tout enhanced performance on the new iMac Pro. But I suspect a lot of you are waiting now on the promised modular Mac Pro – that is, allowing you to mix and match a monitor or monitors of your choice and upgrade display and main machine separately, which is more flexible and presumably more economical than buying these slick all-in-ones. And the dominant machine for producers by far remains the MacBook Pro. No news to report on those fronts. 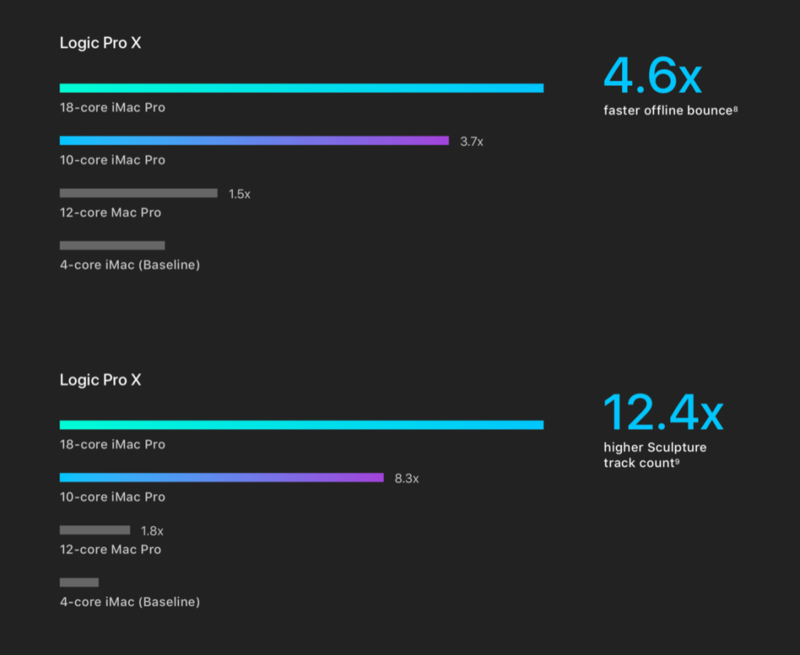 Ooh, look – big graphics justifying buying new pro Apple machines. Feels like old times. Courtesy Apple. At least computation does continue to benefit performance, for those of you pushing the envelope with high track counts and the like. Logic Pro X 10.4 is available now on the Mac App Store.